Join us as we kick off our first 5k Run/Walk in memory of Katie Bunch. All proceeds will go towards the Katie Bunch Servant Leader Scholarship. 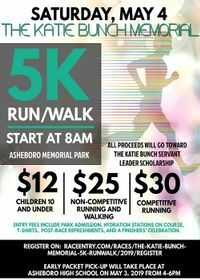 May 4, 2019 Memorial Park 800 South Church St. Asheboro, NC 27203 Registration fees: $25 for all non-competitive runners and walkers. This will include a T-Shirt and a bag at registration $30 for all competitive runners that will be timed. This will include a T-Shirt and a bag at registration. All top winners out of age divisions will also get recognition and a winning prize. $12 for children under 10 to participate. This will include a T-Shirt and a bag at registration. ***We now have a Virtual Category available to all wishing to participate but cannot attend the event Day of. This is $25 for all and will include Race T-Shirt. ***There is a Team/Group option available on Registration. One person will need to sign up as Captain, and participants can join team. This is available for all: Competitive, Non-Competitive, and Children. Early Registration Packet Pick Up will be May 3, 2019 at Asheboro High School from 4-6pm. Registration packet pick-up begins at 7:30 the morning of the event. Upper Level Shelter at Memorial Park. To Register, please go to: https://www.raceentry.com/races/the-katie-bunch-memorial-5k-runwalk/2019/register ***Registration is open NOW! Registration ends April 26, 2019 This event will be Timed by Go Sports Timing and Events!